We are happy to share with you about a new initiative step taken by Team SpiderKerala to take our site to the next extend. SpiderKerala is growing day by day with members participation and also the number of visitors are much motivated to visit our site. Now spiderkerala is working more to reach our name through direct contacts. Recently a team of members from spiderkerala had a visit to the shooting location of an upcoming malayalam movie 'Doctor Love'. We had a warm welcome from the part of all at the shooting location. We got a great chance to meet our dear 'Bharat Salim Kumar' and was given time to have an exclusive interview with him. We are planning for more initiatives and projects to take spiderkerala directly reach the people. It is really a proud moment for all of us at spiderkerala, as the fame of SPK is growing more. First of all my hearty congratulations to the web master, the editors and other team members of the Spiderkerala for making this web site as a major site on any matter relating to Kerala. The most used web search engine is Google. If anyone tries to find any topic relating/pertaining to Kerala, surely there will at least one site name of Spiderkerala, if not more. In many cases Spiderkerala will be the first site coming out on the Google search. This is due to the efforts of the team. The site has grown enormously during the short time and it is a widely referred site for matters on Kerala. Your new program to reach out through direct contact will surely further expand the horizon of Spiderkerala and it will reach to new hights. Once again hearty congratulations and best wishes. Hearty congratulations to SPK and the leaders, whose dedicated effort lead SpiderKerala to this extent. I wish Spider Kerala to emerge as the best available site related to Kerala. Hearty congragulations from my side too to the entire team of SPK for making the site this successful. I'm sure that with the dedicated efforts and hard work of the leaders as well as of the members of the site, it will come out as one of the most reliable and reputed sites available on the net for information on Kerala. Great to see this pic. It's once again a good move. Good chance for us promote our site and their film. This is a great opportunity! Come on members we can do it...! This is a good step. Knowing the State from the pulses of the people. I feel certain special functions/rituals related our State also must be covered by those who get chances. Any special topic related must not be missed. Ultimately this must be the site for ready reference about Kerala. Any search should take to this site. Let us all work together for it. Congratulations for the new step. This is a great moment for the entire spider kerala team and definitely will be a good motivation to all the members who really love to see SPK to be the most trusted site for Kerala Related Information.We are waiting for further news about this initiative. spiderkerala have made a significant step towards its dream of getting into the people. Today being the best Malayalam site available on the web. But I believe that spiderkerala can offer much more than its present state. Development comes proportional to the growth. Being a member here just for a month, i realize the exponential growth of our site. Number of members contributing with quality articles have increased considerably. This a achievement by the spiderekerala crew and will serve as a spark to its members. Let us hope and do all the hardwork for the success of spiderkerala. Hearty congrats to you and all the team leaders of SPK. Even though I'm new to this site,i can see how active and informative and the site is. Really amazed of the hard work that everyone is putting in. This is one of the happiest moments of SPK. I'm sure that SPK will turn out to be the most reliable and successful site among various information counters available on net. A lot of congratulations to the whole team of Spider Kerala for making this site(SPK) successful. 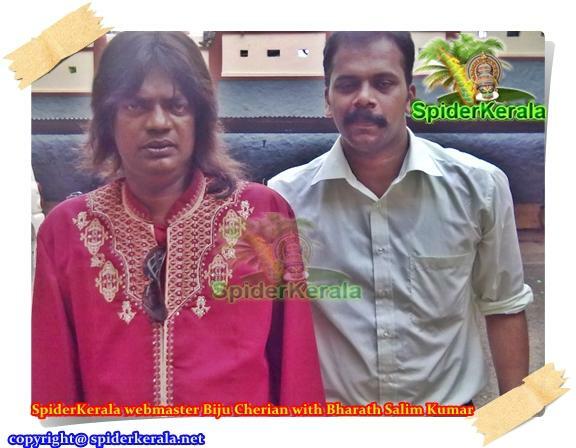 It is all due to the hard work of webmaster and whole team members of Spider Kerala. In my earlier posting I forgot to mention one thing. The titles Bharath and Urvasi given to the best actor and best actress have been discontinued by the Government of India since a few years back.I am just mentioning this here since you have used that title with this year's best actor Salim Kumar.